Indeed, it should be noted that the first efforts to organize a congregation in 1914 for Byzantine (Greek) Rusin-Ruthenian Catholics in Bethlehem came to no avail. The chief leader in this effort, Michael Yosko (Yasko), Sr., however, was not to be deterred by the fact that only fourteen families responded. As his daughter, Susanna Yosko Fetsko, recalls to this date, he was not satisfied with being a member of the local Slovak Roman Catholic congregation (SS Cyril and Methodius) and only attending Byzantine Catholic services at St. Michael Byzantine Catholic Church in neighboring Allentown on solemn holydays. Since Mr. Yosko himself settled his family in Bethlehem from a coal-mining town near Hazleton (ca. 1906), many other Byzantine Catholic families had also moved to Bethlehem with the hope of finding a better future by working at the Bethlehem Steel Company, the area’s largest employer. Still some families were content to join Roman Rite parishes; others saw no need to abandon the local Russian Orthodox parish of St. Nicholas (founded 1915) since the liturgical rites there were similar to standard Greek Catholic rites. Attempts to found a common Byzantine Rite parish for Rusins (Ruthenans) and Galicians (Ukrainians), the same people from a religious point of view, but ethnically diverse, also came to no avail. The ethnic rivalries of the Old Austro-Hungarian Empire still persisted in America. A Ukrainian Catholic mission congregation was in fact begun in 1916 at a chapel in the still existing Holy Infancy Roman Catholic Church on East Fourth Street. In 1918, they were to purchase a Protestant Church at Third and Carbon Streets and dedicate it to St. Josaphat. The first efforts of Mr.Yosko, though initially unsuccessful, did bring like-minded people together. These included: John Roka Sr. and Michael Svajko, who, with Mr. Yosko, were to become the first officers of SS Peter and Paul Church whose foundation was not too far on the horizon. It was for people as these that Mr. Yosko arranged to have the pastor of St. Michael Church come to offer occasional services beginning in 1914. For these people it had to be inconceivable that enough support for a church could not be found. After all, when people’s financial interest was involved mobilization could, and did previously, occur. An important case in point was the founding of the SS Peter and Paul Society, Branch No. 429, of the Greek Catholic Union of the U.S.A., in November of 1906 at the home of Michael Yosko by eighteen Byzantine Catholics. A Ladies Society was likewise founded in the following year by one Anne Martin. It was the St. Anne Society, Branch No. 435. These fraternal benefit societies not only defined community, they were important for their fraternal activities and for the life insurance they provided member families. At first the parish organizers arranged for the old Hungarian Catholic church to be used, then the Irish church, Holy Infancy, as in the instance of the Ukrainians. Although most of the Greek Catholic community attended the Slovak church at the time, it was politically impossible for them to arrange for services there. Through the years 1915-1916 persistent efforts were made to sign on families and solicit funds, not only from committed families, but also from interested local businessmen. One of the most significant of these was George Slafkosky, a hotel-bar owner, who was the father-in-law of two of Mr. Yosko’s children. By 1916, enough money was raised to purchase lots at East Fifth and Edward Streets in the south side Bethlehem, in the borough of Northampton Heights, from the then First National Bank and Trust Company. Even before plans for a permanent church could be drawn up, there was a great urge to have a building, no matter how modest, on site, some place congregants could call “their own”. The structure that was erected truly did leave much to be desired. It was a 20’ X 20’ “shanty” (to use the parishioners’ own words at the time). 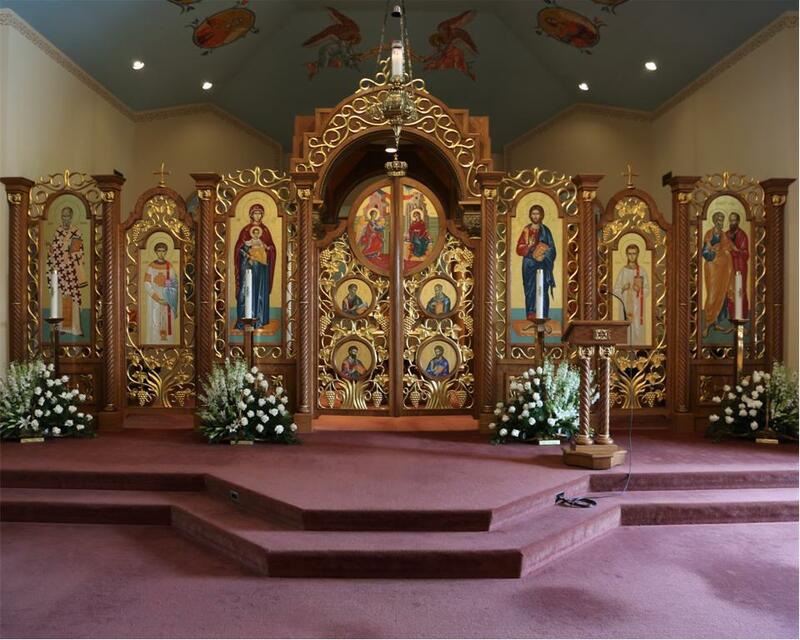 But at least it was a place of assemblage where the Reverend Michael Mitro, Pastor of St. Michael Church in Allentown, could celebrate the Divine Liturgy on a monthly basis. The congregation’s first cantor was John Ledney, a steel worker. The first officers were the aforementioned Mr. Yosko, Mr. Roka, and Mr. Svajko.